KIEV, Ukraine -- Ukraine's Deputy Prosecutor General Renat Kuzmin claims the probe into the case of ex-president Viktor Yushchenko's poisoning has not made any progress in five years, according to Kuzmin's statement for the Ukraina TV Channel on Friday. 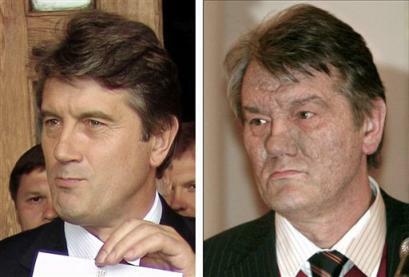 Viktor Yushchenko before and after alleged poisoning. According to the deputy prosecutor general, who has been in charge of the investigation into this case, over five years the probe into the poisoning of Viktor Yushchenko has not given any answers. At the same time he stressed that a former investigator in the case, Valentyna Klymovych, received eight volumes on this case, and when she left her post, there were already more than 300 such volumes. But, nevertheless, according to Kuzmin, "it is still unclear who poisoned, why poisoned, and whether the poisoning took place in fact - there is no truth in this case". "The investigation is launched from the very beginning. It seems as if there have not been those five years of investigation," the deputy prosecutor general added. As reported, the case was being probed by an investigative group led by Halyna Klymovych, who resigned from the post in April 2010. Later she said that she resigned from the Prosecutor General's Office (PGO) after she realized that she would not be allowed to investigate the case. As reported, Yushchenko fell ill shortly after a dinner on September 5, 2004 with the then chief of the Security Service of Ukraine (SBU) Ihor Smeshko, and his deputy, Volodymyr Satsiuk, whom he had invited to discuss the 2004 election campaign.